Spring Turkey Hunting Season at CREW opens tomorrow, March 1st, and runs through March 9th at the CREW Cypress Dome Trails, Caracara Prairie Preserve, and in portions of the Flint Pen Strand unit of CREW. Specific spring turkey season regulations for CREW are listed below. Complete regs can be accessed at the Florida Fish & Wildlife Conservation Commission website. The Cypress Dome Trails will remain open to other users – hikers, bikers, geocachers – during hunting seasons. However, camping and horseback permits will not be issued during this hunt season. Hikers and bikers are encouraged to wear bright colors (hunter orange) when hiking during hunting seasons. Turkey hunting hours end at 1 PM each day. No hunting is allowed at the CREW Marsh Trails or at the Bird Rookery Swamp Trails. 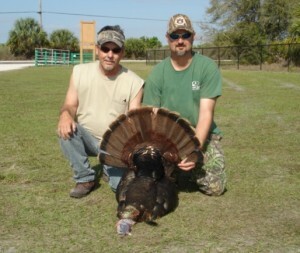 Permit, Stamp and License Requirements – Quota permit, hunting license, management area permit and wild turkey permit. Legal to Hunt – Bearded turkey or gobbler. Hunting with firearms other than shotguns or using a shot size larger than #2 is prohibited.